This playground is set in a small valley surrounded by large trees and rock outcrops – a dramatic topography that characterizes the northern part of Central Park. The Conservancy's playground designers chose the playground's colors, layout and forms to blend with the surrounding landscape. Playground highlights include a sandbox, embankment slide, modern climbers and spinners, tire and bucket swings and a contoured safety surface. Four granite posts spray water into a centrally located water play area. The Central Park Conservancy reconstructed the playground in 2006. 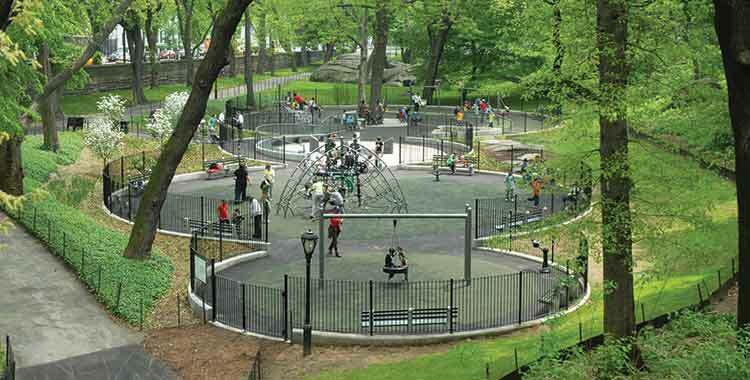 The Playground Partners program was founded in 1991 to improve Central Park playgrounds. Funds raised go directly towards the preservation, care, and daily inspection of these cherished play spaces.